NoSQL database service that provides fast and predictable performance with seamless scalability. You can create database tables that can store and retrieve any amount of data, and serve any level of request traffic. You can scale up or scale down your tables’ throughput capacity without downtime or performance degradation, and use the AWS Management Console to monitor resource utilization and performance metrics. Provides on-demand backup capability as well as enable point-in-time recovery for your DynamoDB tables. With point-in-time recovery, you can restore that table to any point in time during the last 35 days. All of your data is stored in partitions, backed by solid state disks (SSDs) and automatically replicated across multiple AZs in an AWS region, providing built-in high availability and data durability. You can create tables that are automatically replicated across two or more AWS Regions, with full support for multi-master writes. DynamoDB stores data in a table, which is a collection of data. There is an initial limit of 256 tables per region. DynamoDB uses primary keys to uniquely identify each item in a table and secondary indexes to provide more querying flexibility. Each table contains zero or more items. DynamoDB supports nested attributes up to 32 levels deep. Primary Key – uniquely identifies each item in the table, so that no two items can have the same key. Must be scalar. Partition key – a simple primary key, composed of one attribute. Partition key and sort key (composite primary key) – composed of two attributes. DynamoDB uses the partition key value as input to an internal hash function. The output from the hash function determines the partition in which the item will be stored. All items with the same partition key are stored together, in sorted order by sort key value. If no sort key is used, no two items can have the same partition key value. Secondary Indexes – lets you query the data in the table using an alternate key, in addition to queries against the primary key. You can create one or more secondary indexes on a table. You can define up to 5 global secondary indexes and 5 local secondary indexes per table. DynamoDB Streams – an optional feature that captures data modification events in DynamoDB tables. A new item is added to the table: captures an image of the entire item, including all of its attributes. An item is updated: captures the “before” and “after” image of any attributes that were modified in the item. An item is deleted from the table: captures an image of the entire item before it was deleted. Each stream record also contains the name of the table, the event timestamp, and other metadata. Stream records are organized into groups, or shards. 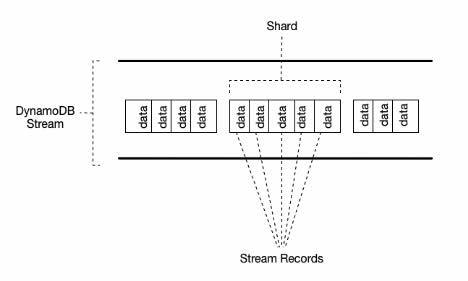 Each shard acts as a container for multiple stream records, and contains information required for accessing and iterating through these records. Stream records have a lifetime of 24 hours; after that, they are automatically removed from the stream. You can use DynamoDB Streams together with AWS Lambda to create a trigger, which is a code that executes automatically whenever an event of interest appears in a stream. DynamoDB Streams enables powerful solutions such as data replication within and across Regions, materialized views of data in DynamoDB tables, data analysis using Kinesis materialized views, and much more. Scalar Types – A scalar type can represent exactly one value. The scalar types are number, string, binary, Boolean, and null. Primary keys should be scalar types. Document Types – A document type can represent a complex structure with nested attributes—such as you would find in a JSON document. The document types are list and map. Set Types – A set type can represent multiple scalar values. The set types are string set, number set, and binary set. When you read data from a DynamoDB table, the response might not reflect the results of a recently completed write operation. The response might include some stale data, but you should eventually have consistent reads. When you request a strongly consistent read, DynamoDB returns a response with the most up-to-date data, reflecting the updates from all prior write operations that were successful. A strongly consistent read might not be available if there is a network delay or outage. One read capacity unit represents one strongly consistent read per second, or two eventually consistent reads per second, for an item up to 4 KB in size. If you need to read an item that is larger than 4 KB, DynamoDB will need to consume additional read capacity units. One write capacity unit represents one write per second for an item up to 1 KB in size. If you need to write an item that is larger than 1 KB, DynamoDB will need to consume additional write capacity units. Throttling prevents your application from consuming too many capacity units. DynamoDB can throttle read or write requests that exceed the throughput settings for a table, and can also throttle read requests exceeds for an index. When a request is throttled, it fails with an HTTP 400 code (Bad Request) and a ProvisionedThroughputExceededException. Define a range (upper and lower limits) for read and write capacity units, and define a target utilization percentage within that range. A table or a global secondary index can increase its provisioned read and write capacity to handle sudden increases in traffic, without request throttling. DynamoDB auto scaling can decrease the throughput when the workload decreases so that you don’t pay for unused provisioned capacity. Provisioned throughput – manually defined maximum amount of capacity that an application can consume from a table or index. If your application exceeds your provisioned throughput settings, it is subject to request throttling. Reserved capacity – with reserved capacity, you pay a one-time upfront fee and commit to a minimum usage level over a period of time, for cost-saving solutions. CUC for Reads – strongly consistent read request consumes one read capacity unit, while an eventually consistent read request consumes 0.5 of a read capacity unit. GetItem – reads a single item from a table. BatchGetItem – reads up to 100 items, from one or more tables. Query – reads multiple items that have the same partition key value. Scan – reads multiple items that have the same partition key value. PutItem – writes a single item to a table. UpdateItem – modifies a single item in the table. DeleteItem – removes a single item from a table. BatchWriteItem – writes up to 25 items to one or more tables. When you use the AWS Management Console to create a new table, DynamoDB auto scaling is enabled for that table by default. Uses the AWS Application Auto Scaling service to dynamically adjust provisioned throughput capacity on your behalf, in response to actual traffic patterns. You create a scaling policy for a table or a global secondary index. The scaling policy specifies whether you want to scale read capacity or write capacity (or both), and the minimum and maximum provisioned capacity unit settings for the table or index. The scaling policy also contains a target utilization, which is the percentage of consumed provisioned throughput at a point in time. DynamoDB auto scaling doesn’t prevent you from manually modifying provisioned throughput settings. If you enable DynamoDB auto scaling for a table that has one or more global secondary indexes, AWS highly recommends that you also apply auto scaling uniformly to those indexes. Quickly identify a resource based on the tags you’ve assigned to it. See AWS bills broken down by tags. Each DynamoDB table can have only one tag with the same key. If you try to add an existing tag (same key), the existing tag value will be updated to the new value. You can use the UpdateItem operation to implement an atomic counter – a numeric attribute that is incremented, unconditionally, without interfering with other write requests. DynamoDB optionally supports conditional writes for these operations: PutItem, UpdateItem, DeleteItem. A conditional write will succeed only if the item attributes meet one or more expected conditions. Conditional writes can be idempotent if the conditional check is on the same attribute that is being updated. DynamoDB performs a given write request only if certain attribute values in the item match what you expect them to be at the time of the request. To get only a few attributes of an item, use a projection expression. An expression attribute name is a placeholder that you use in an expression, as an alternative to an actual attribute name. An expression attribute name must begin with a #, and be followed by one or more alphanumeric characters. Expression attribute values are substitutes for the actual values that you want to compare — values that you might not know until runtime. An expression attribute value must begin with a :, and be followed by one or more alphanumeric characters. For PutItem, UpdateItem and DeleteItem operations, you can specify a condition expression to determine which items should be modified. If the condition expression evaluates to true, the operation succeeds; otherwise, the operation fails. Allows you to define when items in a table expire so that they can be automatically deleted from the database. A key condition expression is a search criteria that determines the items to be read from the table or index. You must specify the partition key name and value as an equality condition. A single Query operation can retrieve a maximum of 1 MB of data. For further refining of Query results, you can optionally provide a filter expression, to determine which items within the Query results should be returned to you. All of the other results are discarded. The Query operation allows you to limit the number of items that it returns in the result by setting the Limit parameter to the maximum number of items that you want. DynamoDB paginates the results from Query operations, where Query results are divided into “pages” of data that are 1 MB in size (or less). ScannedCount is the number of items that matched the key condition expression, before a filter expression (if present) was applied. Count is the number of items that remain, after a filter expression (if present) was applied. A Scan operation reads every item in a table or a secondary index. By default, a Scan operation returns all of the data attributes for every item in the table or index. Scan always returns a result set. If no matching items are found, the result set will be empty. A single Scan request can retrieve a maximum of 1 MB of data. You can optionally provide a filter expression. You can limit the number of items that is returned in the result. DynamoDB paginates the results from Scan operations. ScannedCount is the number of items evaluated, before any ScanFilter is applied. A Scan operation performs eventually consistent reads, by default. By default, the Scan operation processes data sequentially. You can use IAM to restrict DynamoDB backup and restore actions for some resources. All backup and restore actions are captured and recorded in AWS CloudTrail. Each time you create an on-demand backup, the entire table data is backed up. All backups and restores in DynamoDB work without consuming any provisioned throughput on the table. DynamoDB backups do not guarantee causal consistency across items; however, the skew between updates in a backup is usually much less than a second. Backup and restore works only in the same AWS Region as the source table. Pause or cancel the backup operation. Delete the source table of the backup. Disable backups on a table if a backup for that table is in progress. You cannot overwrite an existing table during a restore operation. You restore backups to a new table. For tables with even data distribution across your primary keys, the restore time is proportional to the largest single partition by item count and not the overall table size. If your source table contains data with significant skew, the time to restore may increase. Global tables provide a solution for deploying a multi-region, multi-master database, without having to build and maintain your own replication solution. You specify the AWS regions where you want the table to be available. DynamoDB performs all tasks to create identical tables in these regions, and propagate ongoing data changes to all of them. A single DynamoDB table that functions as a part of a global table. Each replica stores the same set of data items. Any given global table can only have one replica table per region. You can add new or delete replicas from global tables. To ensure eventual consistency, DynamoDB global tables use a “last writer wins” reconciliation between concurrent updates, where DynamoDB makes a best effort to determine the last writer. If a single AWS region becomes isolated or degraded, your application can redirect to a different region and perform reads and writes against a different replica table. DynamoDB also keeps track of any writes that have been performed, but have not yet been propagated to all of the replica tables. Encrypts your data at rest using an AWS Key Management Service (AWS KMS) managed encryption key for DynamoDB. Encryption at rest can be enabled only when you are creating a new DynamoDB table. After encryption at rest is enabled, it can’t be disabled. Access to DynamoDB requires credentials. Aside from valid credentials, you also need to have permissions to create or access DynamoDB resources. You can create indexes and streams only in the context of an existing DynamoDB table, referred to as subresources. Resources and subresources have unique Amazon Resource Names (ARNs) associated with them. A permissions policy describes who has access to what. Resource – use an ARN to identify the resource that the policy applies to. Action – use action keywords to identify resource operations that you want to allow or deny. Effect – specify the effect, either allow or deny, when the user requests the specific action. Principal – the user that the policy is attached to is the implicit principal. Web Identity Federation – Customers can sign in to an identity provider and then obtain temporary security credentials from AWS Security Token Service (AWS STS). Amazon CloudWatch Alarms – Watch a single metric over a time period that you specify, and perform one or more actions based on the value of the metric relative to a given threshold over a number of time periods. Amazon CloudWatch Logs – Monitor, store, and access your log files from AWS CloudTrail or other sources. 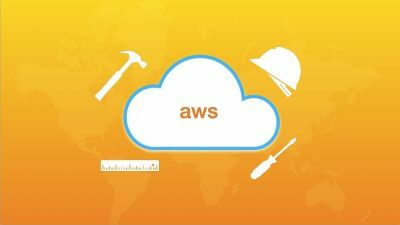 Amazon CloudWatch Events – Match events and route them to one or more target functions or streams to make changes, capture state information, and take corrective action. 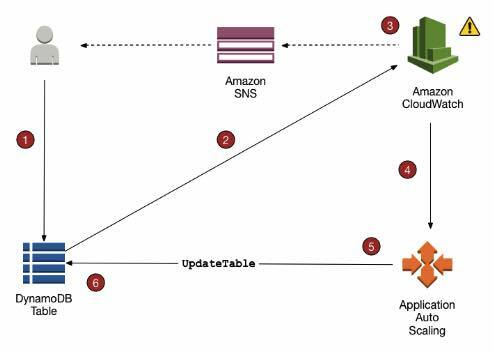 AWS CloudTrail Log Monitoring – Share log files between accounts, monitor CloudTrail log files in real time by sending them to CloudWatch Logs, write log processing applications in Java, and validate that your log files have not changed after delivery by CloudTrail. Using the information collected by CloudTrail, you can determine the request that was made to DynamoDB, the IP address from which the request was made, who made the request, when it was made, and additional details. DynamoDB Accelerator (DAX) delivers microsecond response times for accessing eventually consistent data. In RDBMS, data can be queried flexibly, but queries are relatively expensive and don’t scale well in high-traffic situations. In a NoSQL database such as DynamoDB, data can be queried efficiently in a limited number of ways, outside of which queries can be expensive and slow. In RDBMS, you design for flexibility without worrying about implementation details or performance. Query optimization generally doesn’t affect schema design, but normalization is very important. In DynamoDB, you design your schema specifically to make the most common and important queries as fast and as inexpensive as possible. Your data structures are tailored to the specific requirements of your business use cases. For an RDBMS, you can go ahead and create a normalized data model without thinking about access patterns. You can then extend it later when new questions and query requirements arise. You can organize each type of data into its own table. For DynamoDB, by contrast, you shouldn’t start designing your schema until you know the questions it will need to answer. Understanding the business problems and the application use cases up front is essential. You should maintain as few tables as possible in a DynamoDB application. Most well designed applications require only one table. Data size: Knowing how much data will be stored and requested at one time will help determine the most effective way to partition the data. Data shape: Instead of reshaping data when a query is processed, a NoSQL database organizes data so that its shape in the database corresponds with what will be queried. Data velocity: DynamoDB scales by increasing the number of physical partitions that are available to process queries, and by efficiently distributing data across those partitions. Knowing in advance what the peak query loads might be helps determine how to partition data to best use I/O capacity. DynamoDB provides some flexibility in your per-partition throughput provisioning by providing burst capacity. To better accommodate uneven access patterns, DynamoDB adaptive capacity enables your application to continue reading and writing to ‘hot’ partitions without being throttled, by automatically increasing throughput capacity for partitions that receive more traffic. The optimal usage of a table’s provisioned throughput depends not only on the workload patterns of individual items, but also on the partition-key design. In general, you will use your provisioned throughput more efficiently as the ratio of partition key values accessed to the total number of partition key values increases. Structure the primary key elements to avoid one heavily requested partition key value that slows overall performance. Distribute loads more evenly across a partition key space by adding a random number to the end of the partition key values. Then you randomize the writes across the larger space. A randomizing strategy can greatly improve write throughput, but it’s difficult to read a specific item because you don’t know which suffix value was used when writing the item. Instead of using a random number to distribute the items among partitions, use a number that you can calculate based upon something that you want to query on. Distribute write activity efficiently during data upload by using the sort key to load items from each partition key value, keeping more DynamoDB servers busy simultaneously and improving your throughput performance. Well-designed sort keys gather related information together in one place where it can be queried efficiently. Composite sort keys let you define hierarchical (one-to-many) relationships in your data that you can query at any level of the hierarchy. Use indexes efficiently by keeping the number of indexes to a minimum and avoid indexing tables that experience heavy write activity. Optimize Frequent Queries to Avoid Fetches. Be Aware of Item-Collection Size Limits When Creating Local Secondary Indexes. DynamoDB charges per GB of disk space that your table consumes. The first 25 GB consumed per month is free. DynamoDB charges for Provisioned Throughput —- WCU and RCU, Reserved Capacity and Data Transfer Out. You should round up to the nearest KB when estimating how many capacity units to provision. There are additional charges for DAX, Global Tables, On-demand Backups (per GB), Continuous backups and point-in-time recovery (per GB), Table Restorations (per GB), and Streams (read request units).